Pratibha Patil has won the race to become India's president, becoming Saturday the first woman to hold the post in a symbolic victory for the hundreds of millions of Indian women who contend with widespread discrimination. While India has had several women in positions of power — most notably Indira Gandhi, who was elected to the more powerful position of prime minister in 1966, and her daughter-in-law, Sonia Gandhi, who currently heads the Congress party — many women still face rampant discrimination. Patil, the 72-year-old candidate of the governing Congress party and its political allies, defeated the candidate of the opposition Bharatiya Janata Party, the incumbent Vice President Bhairon Singh Shekhawat, in the vote by national lawmakers and state legislators, the election commission announced Saturday. Patil received nearly two-thirds of the vote, the commission said. Hundreds of delighted Congress supporters danced in the streets, banging drums and setting off firecrackers outside her home in New Delhi and in her hometown in the state of Maharashtra. The election of a woman to the largely ceremonial post continues an Indian tradition using the presidency to bolster disadvantaged communities. Patil is a lawyer by training but has been an active politician since 1960, reports CBS News correspondent Ranjan Gupta. "Women in particular have welcomed Patil's election as they are discriminated against, and there is expectation that a woman president could help change things for them," Gupta said. Hindu-majority India has had three Muslim presidents, including incumbent A. P. J. Abdul Kalam, since winning independence from Britain in 1947. It has also had a president from the minority Sikh community, and Kalam's predecessor, K. R. Narayanan, came from the bottom of the society's complex social hierarchy. Many Indian families regard daughters as a liability due to a tradition requiring a bride's family to pay a groom's family a large dowry of cash and gifts. As a consequence their education is often neglected, and many don't get adequate medical treatment when ill.
International groups estimate that some 10 million female fetuses have been aborted in the country over the last two decades. It was not clear how much impact Patil would have as president. Opponents derided her nomination, saying she lacked the national stature for the job and her only qualification was unswerving loyalty to the powerful Gandhi family. Her emergence onto the national stage also highlighted several scandals involving family members, two of who are under investigation by police. And her comments ahead of the election calling on Indian women to abandon wearing headscarves was roundly denounced by Muslim leaders and by historians — who disputed her assertion that women only started wearing them in India to save themselves from 16th century Muslim invaders. The nomination of Patil also surprised many, given her lack of national recognition despite more than four decades in politics. Patil was a lawyer before she joined politics and became a member of the state legislature in 1962. 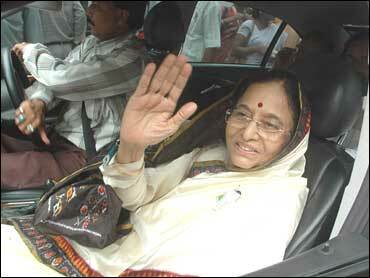 She was appointed a minister several times in the Maharashtra state government between 1962 and 1985. In the following decade, she served as a member of Indian Parliament. Her most recent post was as governor of the northern state of Rajasthan. She will replace Kalam, who has ended his five-year term and following custom did not seek a second term.